Want something a little different? 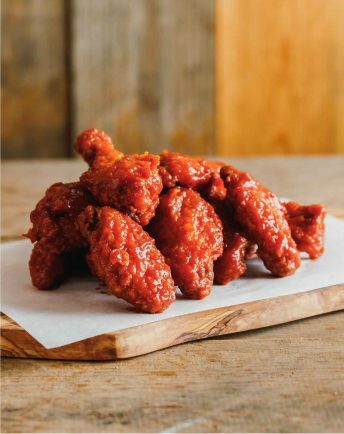 Then choose from our range of the freshest boneless chicken treats for yourself or irresistible chicken-on-the-bone dinners to share with friends and even our addictive chicken wings. Our selection is the best in town and all coated in the freshest herbs and spices for all tastes. 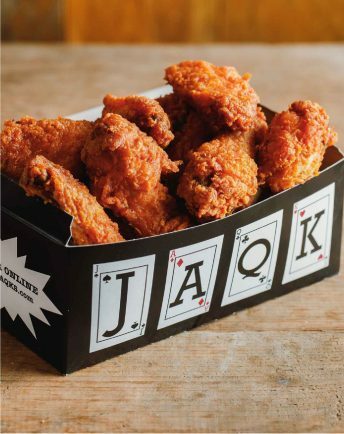 Freshly cooked chicken wings coated in JAQK’S hot n spicy mix. Available to buy as 3, 6, 10 or 20 wings. Freshly cooked chicken wings coated in JAQK’S buffalo sauce. Available to buy as 3, 6, 10 or 20 wings. 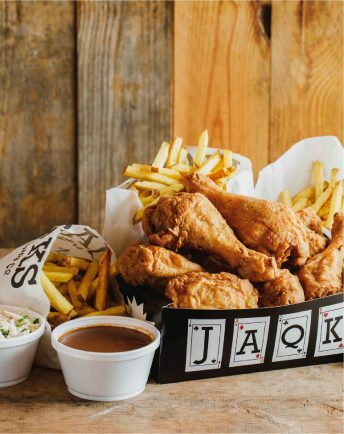 100% chicken breast fillet cut in to bite-size pieces prepared fresh in store using our original recipe of homemade herbs and spices. 100% chicken breast fillet prepared fresh using our original recipe or herbs and spices and covered in a homemade sauce of your choice: barbeque, buffalo, jerk or hot chilli. Winner, Winner! 8, 10 or 12 pieces of fresh chicken, 4 regular chips, 1 large gravy and 1 coleslaw. Our rustic chips is hand-cut in store and using only the best in locally grown potatoes.